As parents, we make plenty of sacrifices for our children -- losing sleep to care for a sick child, spending hours in the car to shuffle children to countless activities, setting aside money for their education or other ventures...the list goes on and on. It is fair to say that these sacrifices can cause stress and frustration in daily life. I believe that all of the sacrifices and the feelings of frustration and stress are erased from our memory when we receive a spontaneous hug, see a smile after an accomplishment, or hear our children say "thank you". These are a few examples of how our children repay us for our hard work. Recently, I have been thinking that one of the greatest gifts a child can give to a parent is by inspiring us to be our best. Susanna Leonard Hill received a "gift" from her children. They have inspired her to write her "best" stories. Her two-year-old son's love of heavy machinery lead her to write her first book, The House that Mack Built. Her book Not Yet Rose was written after her experience of helping her own children understand the anticipation of a new baby. Her son's troubles falling asleep at night may have been frustrating at times, but it was partially responsible for her book Can't Sleep without Sheep (Iza Trapani). In many interviews including one with Miss Marple's Musings Susanna talks about being a mom and a writer, "My routine for writing is as follows: Write whenever I have time! Even though writing is my career, my first duty is to my family." 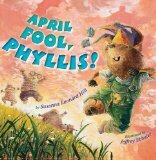 Despite this commitment to her family, she has managed to publish ten books for children including the very popular April Fool, Phyllis! that just went on a World Tour. In addition to the books she has a very successful website and blog that helps teachers with lesson ideas, parents with book recommendations, and aspiring writer's with advice. I was so excited to celebrate Susanna's birthday with my family after getting to know her through the 12 x 12 in 2012 Picture Book Writing Challenge. With so many great books to choose from I wasn't surprised that a birthday celebration activity came easily. My two boys loved her book No Sword Fighting in the House. It is a story about two brothers, their gardening-award-seeking-mother, a couple of cows, and ruined daffodils. From an interview with Just Children's Books, "When my son was 3, he was very interested in knights. 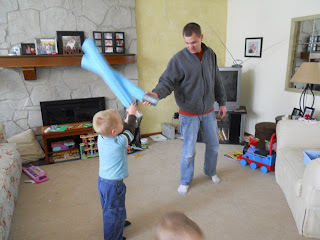 My husband thought it would be a great idea to make the kids little wooden swords (they were 5, 3, and 1 mind you!) Then, as an after-thought, he made them cardboard helmets (something backwards there.) Predictably, the kids loved them. 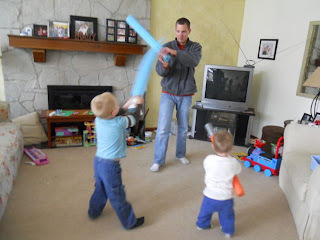 They ran around the house and jumped all over the furniture swinging their swords and yelling, and I did have to say, "No sword fighting in the house!" My thoughts were in sync with Susanna's husband. However, instead of wooden swords and cardboard helmets I had the idea to make swords (or light sabers) out of a common swimming pool accessory. We measured our swimming "noodle" and marked it at the middle. We cut the noodle in half using a kitchen knife. 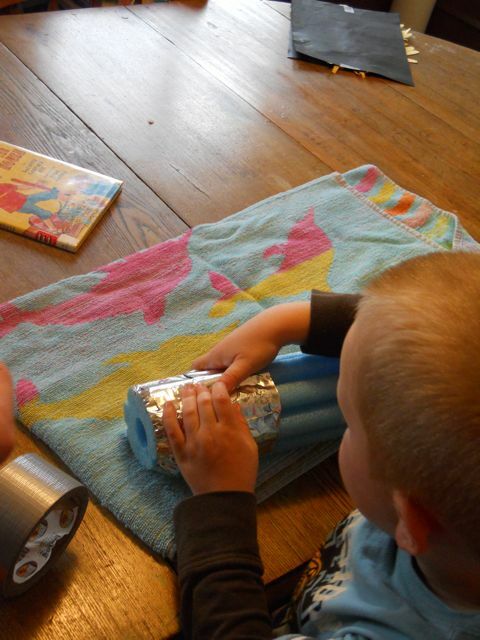 We covered one end with duct tape to make the grip handle. My son chose to use the shiny tape. We used regular duct tape for my younger son's sword. I wrapped enough tape around to cover the "noodle" completely to make a nice grip. 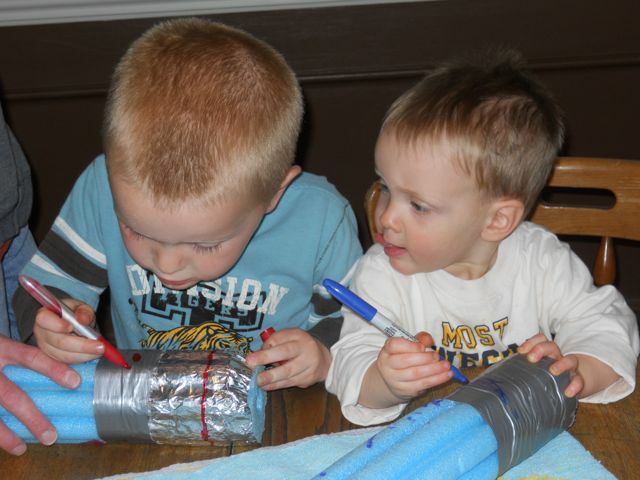 We used Sharpie markers to add buttons and controls to our sword! My son said that one of this buttons made his sword go "super fast"! The little man was really serious about his sword decorating. The seriousness didn't last long when it came time to fight! And yes, we were sword fighting in the house! For on this afternoon my children inspired me to be the best dad I could be. I was able to walk away from the computer and chores to spend time playing swords with my dudes! The most obvious birthday memory is that my dad always made birthday hunts for us. I have two brothers and a sister, and from the time we were 3 (when my dad would read the clues to us) until we were about 13 (except for my older brother who got a hunt until he was 16), every year we would wake up the morning of our birthday to find a piece of paper taped to the headboard of the bed. "Good Morning! Happy Birthday!" followed by a clue! The clues were riddles, codes, mirror writing, crosswords, symbols, anagrams -- you name it, my dad did it. The older we got, the harder the clues got. Each clue would lead us to a present, with the next clue taped on it. We would collect all the presents one at a time as we solved the clues and found them, depositing them on my parents' bed. Only when we'd found them all would we start opening. It was totally fun. And we all helped each other :) The clues were challenging enough anyway, but on a school morning there was also a time limit :) It was these hunts that gave me the treasure hunt idea for April Fool, Phyllis! (And one of the reasons the book is dedicated to my sibs!) It was such a part of my childhood that I continued the tradition with my own children. I also remember my 6th birthday party. We lived in New York City, across the street from Central Park. For my 6th birthday, we took my friends, a picnic, and birthday cake to the meadow where we climbed on the rocks and flew a kite (not at the same time:)) It was very breezy that day -- perfect for the kite, but a challenge for my mom to light the candles on the cake. My 8th birthday was my first slumber party. I had desperately wanted one, and agonized over who to invite, because my mom said no more than 6 friends. We borrowed a book of scary stories from the school library and read it in the dark by flashlight -- very spooky! I still remember one about a vampire who had to be stopped by pressing a silver cross into his forehead! But what my mom remembers is that I was sound asleep by 10pm, while the rest of my friends were up well into the wee hours to my parents' considerable lack of amusement! Happy Birthday Susanna! My family had so much fun reading the Phyllis books, Can't Sleep Without Sheep, and No Sword Fighting in the House! We hope you have a wonderful birthday and we want to thank you for sharing so many of your birthday memories! 1. Susanna Leonard Hill's Website + Blog + ACTIVITY IDEAS! Thank you so much for this lovely birthday post and for the birthday wishes! It's an honor to be on your wonderful blog! You are welcome Susanna! Thank you for writing books that allowed me to make memories with my boys. Oh, Eric, this is another one of your unforgettable posts packed with fun and super snippets about Susanna and her beautiful books. I LOVED hearing about her birthday memories - what a cool family tradition... I really enjoyed hearing about the inspiration to so many of her books. SUPER post and HAPPY BIRTHDAY to Ms Picture Book Perfect! Her birthday stories were great! I am so thankful that she took the time to share! Happy birthday, Susanna! What a cool dad - knowing about that tradition makes my time with April Fool, Phyllis even better. Hope your day is filled with sunshine and cake! 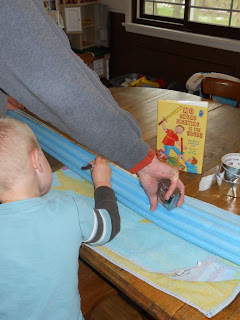 Eric, thanks so much for this overview of Susanna's books and the excellent sword tutorial. Gotta go get some noodles! I loved Susanna's family birthday tradition. What an exciting thing for a child to look forward to each year. You gotta get some noodles - lots of fun! Thanks for the wonderful interview Eric & Susanna. The birthday stories were very entertaining. The clues would've been something to look forward to every year...I'll bet they were better than even the presents as far as anticipation! Thanks for visiting and wishing Susanna "Happy Birthday"! Thanks for the wonderful interview Eric & Susanna. I loved hearing about the birthday traditions. The clues must've been something to look forward to with great anticipation....maybe even more so than the gifts! The swords are great, Eric! Great interview, Eric & Susanna. I loved reading about the traditions. The clues are such fun! Fantastic, Happy Birthday Susanna! Great sword fighting Eric! I was so happy to find No Sword Fighting in the House. 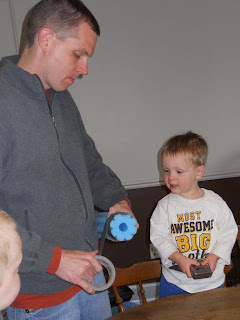 I knew it was going to be a blast for my boys -- and for me! At my aunt's funeral recently, a woman who had known her since having her for a teacher decades ago told of my aunt teaching fencing - and of she and my aunt fencing in the living room and breaking the chandelier! Pool noodles are a much better choice. Loved Susanna's birthday stories. What an incredible dad! Thanks Beth! That is quite a story about your aunt. I am pretty sure pool noodles are capable of doing damage too. I hope we don't find out! Wonderful post as always and I posted a link on my FB fan page as usual! Thank you Sandra. I appreciate that you share my posts. What beautiful birthday tribute for such a lovely author and person. Happy Birthday Susanna. Loved the overviewview of all of her books and the great activities. Thank you Patricia for reading the post and sending birthday wishes out to Susanna! She is a fabulous author ! A wonderful post for a wonderful author. Agreed -- she is wonderful! Thanks for visiting Darshana! Eric, you've done it again...awesome post. Yes Happy Birthday Susanna! Thanks Cheryl! I love hearing your compliment! Keeps me motivated. Thanks for the support. What a great interview! I loved hearing more about how Susanna's family inspired so many of her books. And that birthday hunt is just AWESOME! What an amazing family tradition!! Thanks Julie! It was easy to find a theme for this post. Susanna is all about family and books! So cool. Happy Birthday Susanna!!!!!! Hope you have a great day!! And thank you Eric for this wonderful post and opportunity to learn more about Susanna and birthday memories. You're welcome! She had some great birthday stories! What a fun birthday post! Happy Birthday Susanna! Today is my special day to so we are birthday buddies....Fun to read all the birthday memories and do a little remembering myself! Happy Birthday Sharon! Isn't it fun when you find out you share a birthday with someone! Fantastic interview for such a wonderful person. Happy Birthday Susanna! Loved this Eri! Loved also seeing you and the kids having a wonderful time. Sword fighting sounds like fun...lol. If we ever meet in person - we should duel! Sound good? Happy B-day. The birthday hunts sound like a lot of fun! My dad use to leave clues for Easter egg hunts. Eric, it looks like you had a blast with your kids. My husband and I every Christmas after the presents are wrapped use the left over tubes to have a sword fights. Rena -- That is another great idea for swords. 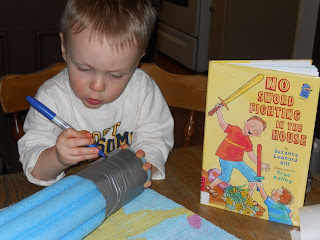 Sounds like we should have a sword fighting battle -- wood swords vs. noodle swords vs. cardboard tube swords! We've made swords with pool noodles, too! Except we used PVC pipe in the center to make them sturdier. The don't hurt as much as wood, but they'll give you a good thump. Thank you, Eric and Happy Birthday,Susanna! Oh my, PVC in the center! That is awesome. I am going to have to try that! Thanks for sharing that tip! Another fun post, Eric. Happy Birthday, Susanna! I am so happy you had a wonderful birthday! Thank Jennifer! This was a really fun birthday to celebrate! Happy Birthday Susanna! I took Phyllis to an illustrator's meeting in Boulder today! And true to form she decided it was time for snow in April! We hurried home, but I think the mountains will be getting quite a bit! And Eric, I have a teen who still likes to bop around with friends with the same type of swords you fellows created! Thanks to you both! Very cool! I think these swords will be around for a long time. Happy Birthday, Susanna! I enjoyed reading about your past birthdays as a child and learning more about you. The sheep book looks adorable. Can't wait to read it someday. Eric, this is a great post and craft idea! Your boys are so cute! Thanks Tina! If I were to pick a favorite book of Susanna's it would be the sheep book. I think you will love it. Happy belated birthday, Susanna! You are such a help and inspiration to us all. 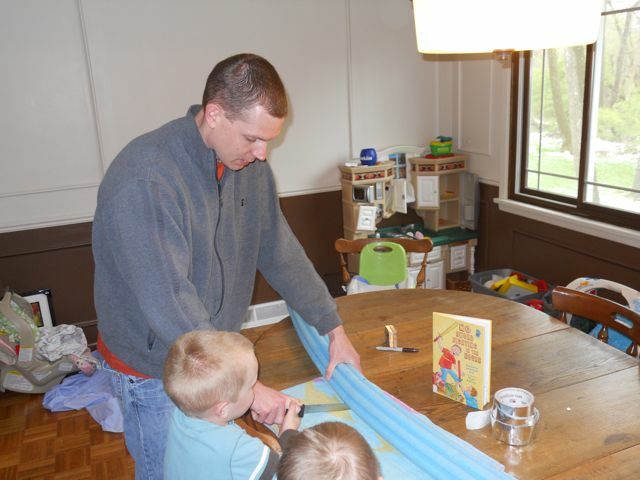 And Eric, my boys are going to love the pool noodle swords. Kirsten -- I'm so happy you made it to the party! Have fun sword fighting with you boys! Thank you Iza! We were sword fighting again today! Loved the birthday hunt story! Happy belated Birthday Susanna. Great idea to create the swords Eric. I'll have to remember that one. We currently use spoons (it never sounds like a good idea when I type it out). Spoon swords! -- I am pretty sure boys can turn anything into a sword!